At just 19 years of age and originally from Katherine, IHD Resident Muriel Scholz is trekking halfway across the world to make a difference. The Volunteer Eco Students Abroad (VESA) program allows students the opportunity to be a part of large-scale humanitarian projects in regions around the world. These areas are not typically addressed by traditional charity or aid. For just under three weeks, Muriel will work with local children where she will teach English and renovate and revitalise existing facilities, such as bathrooms and kitchens. She’ll also be working with the KZN-Ezemvelo Wildlife Authority in two wildlife conservation projects: the Saint Lucia Crocodile Center; and the Emdoneni Cheetah Project. As well as helping the local community, Muriel’s keen to experience the travel-aspect of humanitarianism. She’ll meet her first Zulu healer, go snorkelling amongst rays and turtles, and try her hand at white-water rafting, quad bike riding and caving. While Muriel is excited and getting her vaccinations in order, there are a few aspects she’s really looking forward to. Muriel begins her journey to South Africa mid-November and will return to Darwin with a whole new perspective (and hopefully having seen a hippo) in early December. 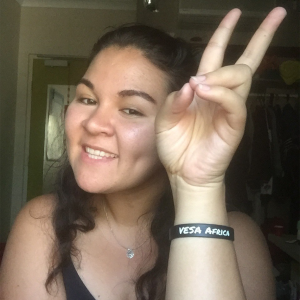 She is currently selling VESA AFRICA wristbands to raise money towards her travel costs. While there is no set amount per wristband, every dollar helps. Money raised will assist in vaccinations, program fees and materials, visas and transportation. You can also donate to her gofundme page or contact her directly.